The Mediterranean City to City Migration (MC2CM) project aims to improve migration governance at local level within a network of cities in Europe and the Southern Mediterranean, with a strong focus on integration and inclusion, as well as on migrants' access to basic services with respect for human rights. It also seeks to strengthen the capacities of cities in this area. In this framework, UCLG worked to create the city network during the initial phase (February 2015 – March 2016) and is currently coordinating the participation of the cities involved in the project. The following cities have joined the project: Amman, Beirut, Lisbon, Lyon, Madrid, Tangier, Tunis, Turin and Vienna. Having concluded the start-up phase, the MC2CM project is now in its phase of implementation through an approach based on three components: Knowledge, Dialogue and Action. The dialogue and knowledge phases represent the main part of the activities that partners and cities are involved in at present. The international dimension of the dialogue component includes a series of 7 peer-to-peer meetings on specific themes linked to the status of migrants in cities. In addition, 2 political conferences have been scheduled in order to develop common political messages to Mediterranean cities that receive migrants. 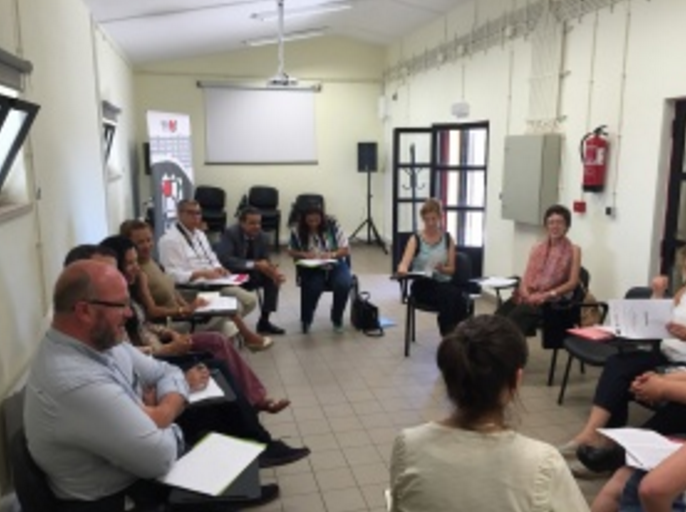 As part of the series of peer-to-peer meetings, the first meeting on social cohesion and inter-cultural and inter-religious dialogue was held in Lisbon on 12 and 13 July 2016 in coordination with the UCLG Committee on Social Inclusion. Tangier, 28 and 29 November 2016, on the mechanisms enabling migrants to enjoy human rights and access basic services at local level. The other peer-to-peer meetings will address the following subjects: Reception of refugees, Inter-institutional coordination, Territorial planning and housing and Education and language. The first political meeting, the project's mid-term conference, will take place in Tangier on 29 November 2016. This conference will be an opportunity to bring together elected officials from the participating cities and other key stakeholders in the Mediterranean to exchange their points of view and approaches to the inclusion of migrants at local level. The knowledge component has also been launched. Local experts were identified in each city and are now working with the support of ICMPD and the local governments concerned, to determine the migration profiles of the participating cities. These profiles will allow for further information to be obtained on the national and local context (migration pattern, migration policy, institutional framework, sectoral policies, etc.) and on the status of migrants in the city (disaggregated statistics, level of access to rights and services, etc.). These profiles will provide a basis for local dialogue with stakeholders from the area in order to identify common priorities for action in this context. The initial results from the profiles will be presented at the political conference in Tangier in November. The MC2CM project, which is funded by the European Commission, is led by ICMPD in partnership with UCLG and UN-Habitat. The project, which was launched in February 2015, will last for 3 years.